An inmate in the Nye County Detention Center found himself in more trouble after he allegedly flicked a bodily fluid at a deputy and blocked his door flap with a feces-filled sock. Jerrid Hutchinson, who is in jail as a result of being charged with felony unlawful use of a controlled substance in May, was charged with unlawful act by prisoner related to human excrement or bodily fluid, after alleged flicking urine on a deputy while he was doing a daily routine inmate count, where officers have to physically go into each cell and count the inmates inside. After the alleged urine incident, other deputies responded and discovered a wet sock blocking Hutchinson’s cuff flap on his cell door as they attempted to close it. After a deputy removed the sock from the flap it was discovered that human feces was inside the sock. The sock was also sitting in the liquid that Hutchinson was flicking at the deputy. A Pahrump man was arrested earlier this week after allegedly kidnapping his ex-girlfriend, taking her car and other belongings, then leading authorities on a high speed chase, according to police. Johnny Lotches, 30, was taken into custody Tuesday and charged with preliminary counts of second-degree kidnapping, false imprisonment, grand larceny auto, auto burglary, petit larceny, failure to yield at stop sign, eluding/endangering persons or property, basic speed 11-15 mph over posted speed limit, turn signal required, proof of insurance required, drive without a license and reckless driving, police said. The Nye County Sheriff’s Office said the situation started when Lotches approached his ex-girlfriend in the Nevada State Bank parking lot at 1301 S. Highway 160 on March 29, and told her to get into her vehicle and to drive away without making a scene. The victim complied, stating that she feared for her life, according to the sheriff’s office. The victim explained that she did not know where the suspect wanted her to drive and fearing for her safety she pulled into a dirt lot off of Highway 372. Upon pulling over, the victim said Lotches began yelling at her and took her cell phone from her and took the keys out of the ignition, attempting to keep her from exiting the vehicle. The victim was able to exit the vehicle as the suspect attempted to grab her from behind, but was unable to get ahold of the victim as she fled. After making contact with the victim about the alleged incident, a sheriff’s deputy made contact with Lotches on the victim’s cell phone which he had possession of and explained that he had left the vehicle at the Quick Save Storage and Mini Mart on Highway 372. The victim was able to retrieve her vehicle at the storage facility, but informed police that Lotches still had her cell phone and $70 to $80 that was in her vehicle at the time of the incident. A clerk inside the Quick Save Storage was able to identify Lotches, as he was inside the business within the hour of law enforcement’s arrival. The clerk also identified the vehicle of the victim with the suspect, as it was on the scene while no other customers were in the business. Lotches was not located on March 29 when the initial incident took place. Then on Tuesday, police received information about Lotches’ whereabouts. Deputies saw his vehicle as they approached the location where he was spotted. After a failed traffic stop, Lotches led sheriff’s office deputies on a pursuit though the southwest end of town, eventually ending after the suspect lost control of his vehicle and rolled it into the desert. Lotches was taken to Desert View Hospital with minor injuries sustained in the crash and then booked into the Nye County Detention Center on the 13 preliminary charges. A Pahrump woman was arrested this week after police alleged that she was aiding a wanted felon. Natalie Morales was taken into custody by the Nye County Sheriff’s Office Tuesday on preliminary harboring/conceal/aid felon at a residence on the 3100 block of Ramona Lane after they allegedly discovered that she was involved in harboring Johnny Lotches. A sheriff’s deputy saw Lotches’ vehicle parked outside of the residence on Ramona Lane and by past contacts, deputies knew that Morales lived at the home. When asked if she knew where Lotches was, Morales said, “Yes, he was here, he left five minutes ago to get diapers from the store,” according to the arrest report. 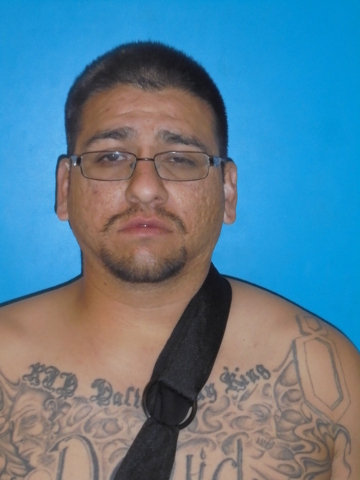 The responding officer was informed that the officer working the Lotches incident had informed Morales of their efforts to find Lotches on felony charges. Morales was placed under arrest and taken to the Nye County Detention Center on the single charge. Contact reporter Mick Akers at makers@pvtimes.com. Follow @mickakers on Twitter.